The city of Nijmegen is building a new bridge across the river Waal to improve the accessibility to the city and traffic flow. The bridge will be built at the historical location known as “De Oversteek” (“The Crossing”), where American soldiers crossed the river to secure the existing Waal bridge during Operation Market Garden. The existing Waal bridge, dating from 1936, was at the time of completion the biggest arch bridge in Europe with a span of 244 m.
The contract to design, build and maintain the new bridge crossing the River Waal at Nijmegen was awarded to a consortium after a design competition in 2009. The bridge has the total length of 1,400 m. The southern approach bridge on the Nijmegen side lies in a curvature with the radius of 500 m. The main span, with the length of 285 m, consists of a single tied arch structure and crosses the river Waal in a straight line, while the northern approach bridge is in a horizontal curvature of 2,000 m.
The approach bridges consist of a succession of concrete arches. The spans of these arches are 42.5 m. The thickness of the arches at the columns is just under 1.5 m and in the centre of the span 0.5 m. The void above the arches is filled with foam concrete to reduce the weight on the arches and covered with mixed aggregates and asphalt layers. 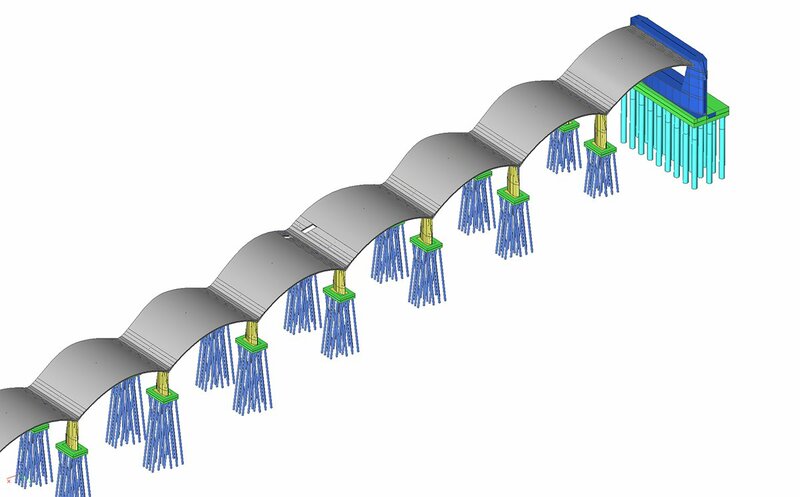 The approach bridges were modelled in Scia Engineer using a 2D beam model for the preliminary and final design stages. Geometrical non-linear calculations were carried out with the 2D beam model. With this model the buckling shapes of the arches were investigated and the second order moments were calculated. 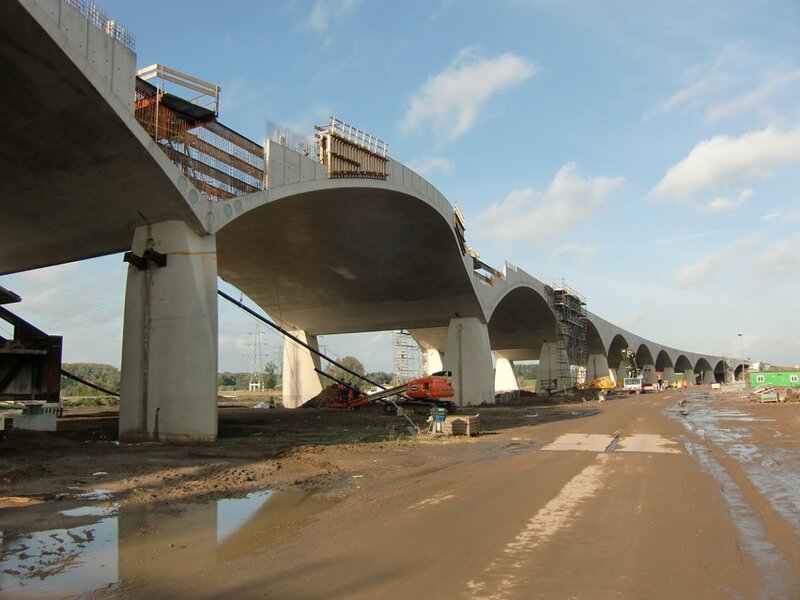 To keep the bridge stable during the construction stages, a prestressed tensioning system of bars and beams, spanning between two arch crests, was set in place to take over the thrust force from the arch, which came into action as the falsework was removed. 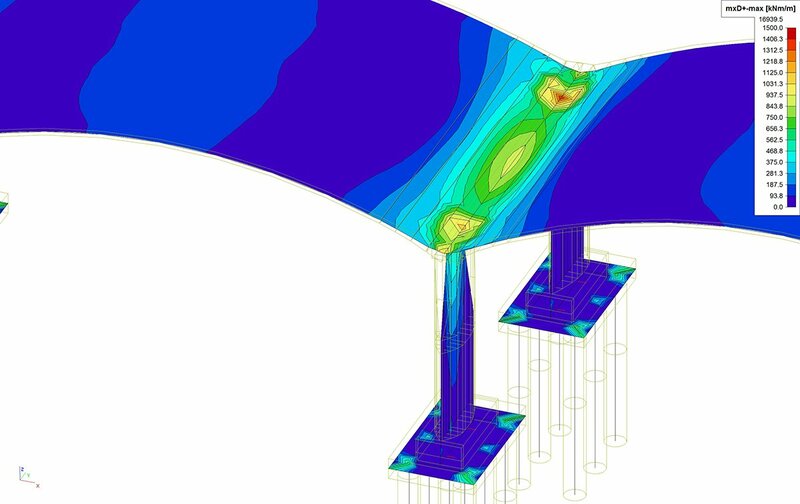 A second 2D beam model was set up to determine the force distribution during the various construction stages. For the detailed design stage, a 3D model has been created consisting of shells, beams and plates. 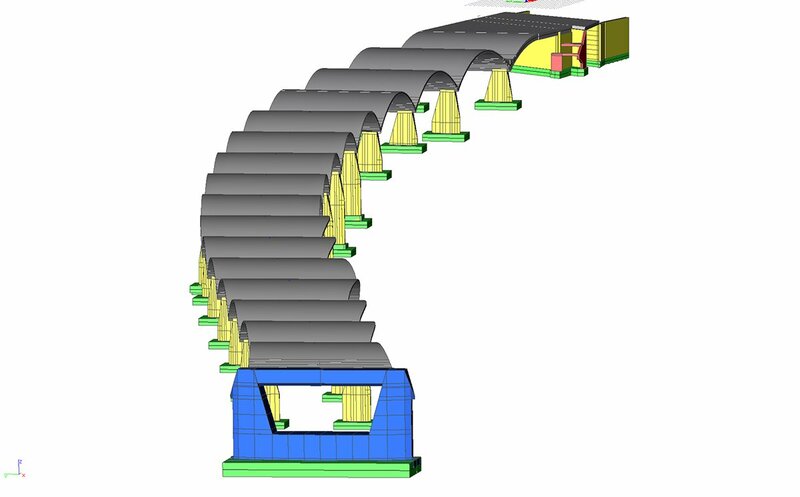 The horizontal curvature of the bridge, the changing angle to every support axis and the varying width of the in plane curved arches has been taken into account. Also, the complex shapes of the columns and river pier have been modelled. The piles with different lengths and horizontal and vertical spring stiffnesses for every axis were also modelled in the model. The loads and load combinations according to the NEN-EN codes were applied. These loads included dead loads, creep and shrinkage loads, traffic loads, temperature loads, wind loads, support settlements, accidental loads and earthquake loads. With the 3D model the internal force distribution was determined in order to design the required reinforcement. Moreover, the pile design has been carried out using the results of the 3D model.